Front row, from left, are fourth-grade students Aaliyah Hire, Alisha Mansfield, Jade Hentzell and Trinity LaJoice. In the back row are Rotary members Paul Schmucker, Robert Smith, Charlie Harris, Kim Conrad and Dr. Richard Brungardt. 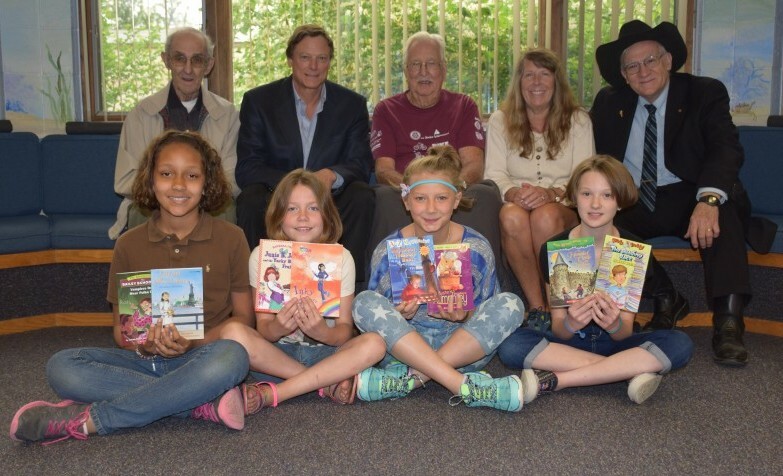 Syracuse-Wawasee Rotary Club will be providing summer reading materials for 1,500 local students again this year. 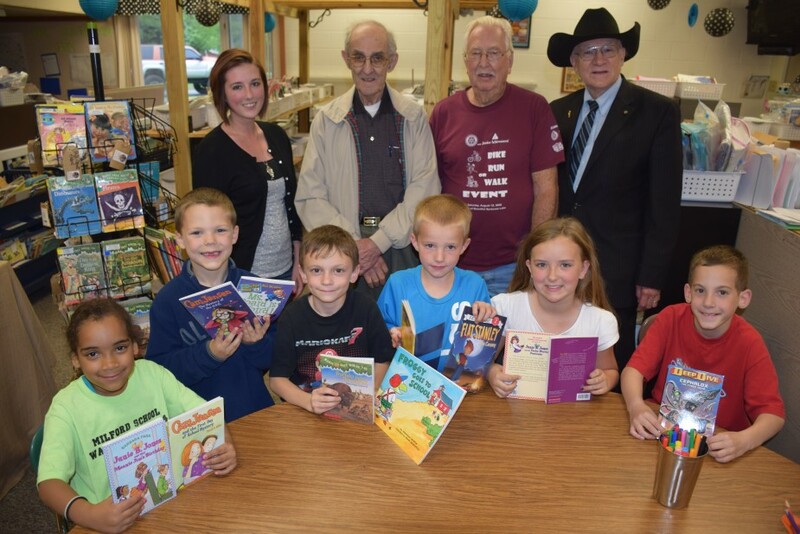 Since receiving a Dekko Foundation grant in 2007, Syracuse-Wawasee Rotary has donated books to North Webster, Syracuse and Milford elementary schools in an effort to keep the love of reading alive during summer break. This year, students will each go home with two books, split into various grade levels and topics. Books came from the Scholastic company, and are paid for using fundraising efforts and community donations. The Harkless Foundation, Tour des Lakes, Sleepy Owl golf outing and Knights of Columbus are large contributors to the fundraising efforts of the Rotary Club. Front row, from left, are students Malayna Clark, Gavin Wiggs, Kaylin Fisher and Javon Moore. In the back row are Rotary members Robert Smith, Paul Schmucker, Kim Conrad, Charlie Harris and Dr. Richard Brungardt. Syracuse-Wawasee Rotary Club has been working in the community since the late 1940s, hosting local speakers and contributing to various organizations. Rotary Club works closely with groups such as the Wawasee Kiwanis Club, the Lakeland Youth Center and the American Legion Post 253. Syracuse-Wawasee Rotary Club holds a meeting at noon each Tuesday at the Sleepy Owl. More information on the organization can be found on its Facebook page. Front row, from left, are students Jada Grisby, Owen Smith, Adam Hite, Jaxon Miller, Summer Rhoads and Michael Wippel. 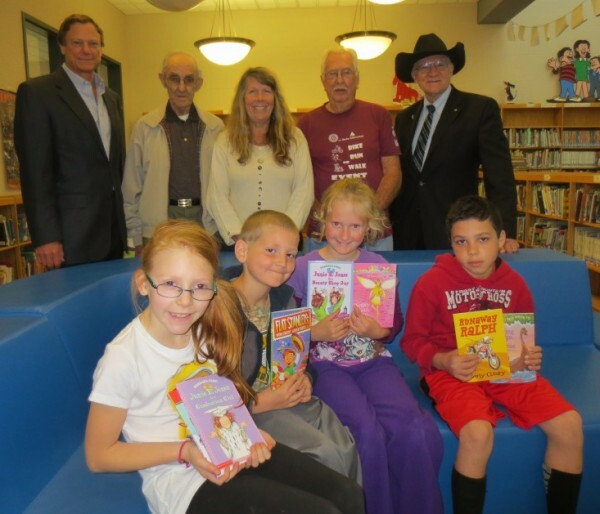 In the back row are teacher Alexis Mast and Rotary members Paul Schmucker, Charlie Harris and Dr. Richard Brungardt.